An artist's interpretation of the European Space Agency's (ESA) Venus Express spacecraft orbiting the second planet in our Solar System. A new study is underway to search for signs of habitability ?on Earth. If that sounds like the ultimate waste of science funding,take a closer look. The project is designed to scan Earth from a distance andnote the evidence for habitability, so that we can better detect that evidenceon distant worlds. In essence, if we want to find life on alien planets, wehave to study a planet knownto host life to determine what clues to look for, scientists say. The researchers are using the European Space Agency's VenusExpress satellite, in orbit around our neighbor planet, to study Earth fromafar, where it appears smaller than a pixel in the spacecraft?s cameras, withno surface details visible. ?We have initiated the first sustained program of Earthobservation from a distant platform,? said David Grinspoon, a Venus Express interdisciplinaryscientist from the Denver Museum of Nature & Science in Colorado. ?We wantto know what can we discern about the Earth?s habitability based on suchobservations. Whatever we learn about Earth, we can then apply to the study of otherworlds.? 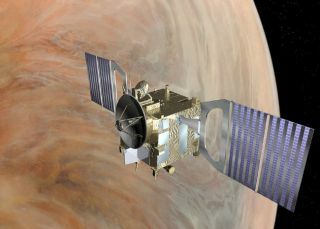 Since its launch in November 2005, Venus Express has been photographingEarth from more than 2 million miles (3.5 million kilometers) away with itsVisible and Infrared Thermal Imaging Spectrometer (VIRTIS). ?When the Earth is in a good position, we observe it two orthree times per month,? said Giuseppe Piccioni, VIRTIS co-principalinvestigator, at the Instituto di Astrofisica Spaziale e Fisica Cosmica in Rome, Italy. The satellite has taken about 40 images of Earth over the past two years. So far, the project has learned that tracking down signs oflife and livability is not as easy as it sounds. ?We see water and molecular oxygen in Earth?s atmosphere,but Venus also shows these signatures,? Piccioni said. ?So looking at thesemolecules is not enough.? A more subtle signal that could differentiate the two typesof worlds is the so-called red edge ? the infrared signal caused byphotosynthetic life. ?Green plants are bright in the near infrared,? Grinspoonsaid. The Venus Express team is only beginning to analyze theEarth data to see if our planet?s red edge is detectable from a distance. Theresearchers also plan to study the signature of Earth when the ocean-sides ofour planet are facing Venus, compared to when the continents are face-on. The study could prove vital in scientists? ongoing quest tolearn more about the ever-growing catalog of distant worlds we?ve found in thegalaxy. Since 1995, astronomers have discovered more than 300 extrasolarplanets. And two new satellite missions ? the ESA/French Space Agency COROTsatellite currently in orbit and NASA?s Kepler Mission spacecraft set tolaunch in March 2009 ? bring us closer to the holy grail of exoplanet research:findingEarth-sized worlds around other stars. ?We are now on the verge of finding Earth-like planets,?Grinspoon said.